The Bible tells us that God is sovereign and that nothing happens unless he decrees it (Lam. 3:37; Prov. 16:33; Amos 3:6), and yet we are told to pray (1 Thess.5:17; Lk. 18:1). How do we reconcile these two seemingly incongruous concepts? 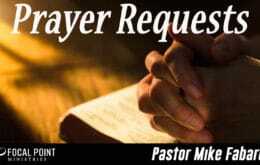 Pastor Mike takes a biblical look at prayer and does it change God's mind?